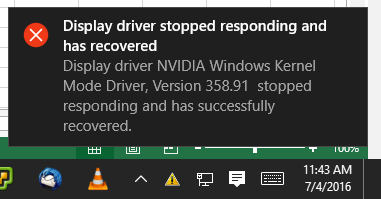 FreeKB - Resolve error "Display driver stopped responding and has recovered" Resolve error "Display driver stopped responding and has recovered"
In this example, message "Display driver stopped responding and has recovered" is appearing. Notice the version in the error message is 358.91. We want to first determine if there is a new version of the driver. Let's assume there is a new driver. Go to your Downloads folder and extract the driver package. At Installation Options, select Express (Recommended). The driver will install. If the error no longer appears, the problem is resolved.